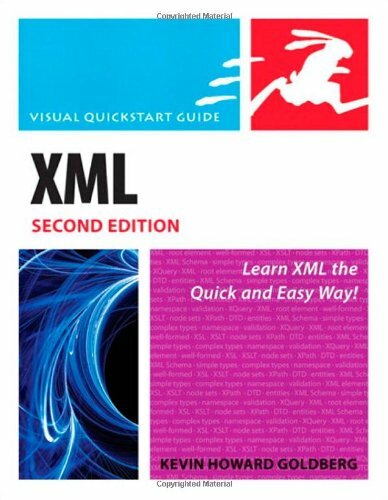 This second edition of the XML Visual Quickstart provides many great examples of XML documents, schemas, XSL and XPath, and other important topics that you need to understand the big picture of XML in use. It is a great overview of XML in context of it's related standards in the overall the XML process. Since it covers a lot of ground, it does not go very deep into any standard or topic, rather it provides just enough to help the reader understand each topic and how it relates to the other topics. A good overview of the XML landscape, but deep enough to be useful to developers to begin using XML as well as non-technical folks wanting to get an understanding of how XML works. The topics are organized very much like a tutorial, building on each other and explaining some fairly complex ideas quickly and simply. An effective way to learn the ropes. Kevin solved the xml challenges like solving a rubics cube pattern. He does a great job of synchronizing xml and xslt and other formatting options. He explained in two words the xml regime, "manages data". This book is a great way to get started if you have not done a lot of HTML and are looking for a way to get your feet wet with XML and it's interactions with HTML.It does a great job of step-by-step leading you through most of the basic concepts used in XML.If you don't know much about XML and want to get started and need a quick reference for figuring out what is going on in an XML file, this is a great starting point.It is compact and the approach is to explain something minimally and then show a example. There are example files to download that the book references.To get the most out of this book, you will have to download the examples. I am not a developer but I have to test interfaces based on a SOA that use XML. I needed a good book which would give me the basics of XML. For my purpose this book had more info than I needed. But it was easy to understand the concepts and the syntax of XML, XSLT, XPath, XML Schema and Namespaces. XML (eXtensible Markup Language) has become the medium to move data in efficient and predictable ways. Derived from a similar markup language, SGML (Standard Generalized Markup Language), XML is structured, but not as highly as SGML. Structure is what itís all about. The very loosely structured HTML (HyperText Markup Language) is also derived from SGML. Even the XML markup looks amazingly like HTML, except, as the author explains, HTML defines how information will look, while XML defines how the information is formatted. If you analyze the code sample above, you should be able to see that there are three siblings defined. Each siblingís information is contained, or wrapped, between the and tags, and that the information on those three siblings is wrapped between the and tags. Taking this one step further, you can think of these sibling "chunks" as parts of a database: the content between the and tags would be defined as a record, while the , , and tags define fields within a record. This content can then be transformed into content in a different format and reused in many different ways. In XML, as in HTML, you can also see that each chunk of information is tagged with an opening and closing tag. Why structure? With a standardized method of defining chunks of information, the information can be easily shared, re-used, translated, and manipulated in infinite ways, yet retain its integrity and its overall definition. XML, being an ASCII text format, is universalóit can be shared among multiple platforms without modification, save for some minor file system issues that are beyond the scope of this review. One major use of XML is in content management systems (CMS), where it can be searched, selectively extracted, and assembled into larger documents that then can be transformed into final deliverables, such as a PDF file, Help files, or a set of HTML files. Sure, you could probably do this with plain text, but without the underlying required structure, it would be a lot harder, and would probably require a large amount of post-assembly editing before even attempting to create the deliverables. Another popular use of XML is in Adobe Flash animations and programs. By building the text content in external files formatted as XML that the Flash file points to, dealing with localized (translated) content is an extremely simple matteróoften just changing the filename links in the main Flash file can transform an English language document into a Spanish, French, or whatever document in momentsóand by maintaining the master files in a database-driven content management system, you can translate content that might be used in multiple documents or even multiple times in the same document once and only once, which, I can assure you, results in huge cost savings. Kevin Howard Goldberg has put together an excellent primer on the multifaceted alphabet soup that is XML. 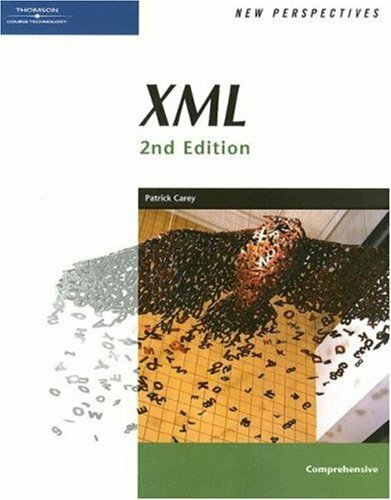 He updated the first edition of this book, originally authored by Elizabeth Castro, with Ms. Castroís assistance, adding information on some of the newer applications of XML: XSL-FO, XSLT 2.0, XPath 2.0, and XQuery 1.0. * XML ñ The basics of writing XML code, and the underlying structure. * XSL ñ How to transform XML into multiple deliverables (HTML, XML, etc.). It also covers XSLT, XPath, and XSL-FO. XSL-FO is most widely used to transform XML files into PDF deliverables. * DTD ñ Document Type Definition. DTDs are the underlying glue that holds the XML together. How? By defining and detailing the rules under which valid XML files function. Separate sections discuss entities and notations, as well as validations (ensuring the XML file follows the rules defined in the DTD). * XML Schema ñ Developed to overcome some of the shortcomings of DTDs, the XML Schema is a more powerful document, designed to give the author even more control over how the XML content is structured and defined. * XML Namespaces ñ A method of combining XML from multiple sources, even if there are identical element names. XML Namespaces provides a method to merge the content while retaining the definitions of each independent element (I hope I got that rightÖ). * Recent W3C (World Wide Web Committee) Recommendations ñ Discusses some of the newest enhancements to the XML specifications including XSLT 2.0, XPath 2.0, and XQuery 1.0. * XML in Practice ñ Applications of XML, especially in Web 2.0 usage. Topics and examples include Ajax, RSS, SOAP, WSDL, KML, ODF, OOXML, eBooks, ePub, and more. I told you it was an alphabet soup! * Appendices ñ Discusses XML editors and tools. Full character set and entity tables. This book is a great introduction to XML. Itís loaded with sample code and examples to get you started. Itís well illustrated and makes great use of color. Peachpit Press also offers a companion website with sample code, updates, etc. XML is not for the faint-of-heart. There are just so many pieces that comprise the XML specification; it can be confusing, even with this Visual Quickstart Guide. The only thing I didnít see in this book, and most likely because of its inherent specialization is the DITA (Darwin Information Typing Architecture) specification. DITA is a highly specialized topic-based XML-based markup language, mainly used for creating instructional materials (user documentation, educational texts, and so on). I recommend this book highly. Although Learning XML covers XML rather broadly, it nevertheless presents the key elements of the technology with enough detail to familiarize the reader with this crucial markup language. This guide is brief enough to tackle in a weekend. Author Erik T. Ray begins with an excellent summary of XML's history as an outgrowth of SGML and HTML. He outlines very clearly the elements of markup, demystifying concepts such as attributes, entities, and namespaces with numerous clear examples. To illustrate a real-world XML application, he gives the reader a look at a document written in DocBook--a publicly available XML document type for publishing technical writings--and explains the sections of the document step by step. A more simplified version of DocBook is used later in the book to illustrate transformation--a powerful benefit of XML. The all-important Document Type Definition (DTD) is covered in depth, but the still-unofficial alternative, XML Schema, is only briefly addressed. The author makes liberal use of graphics, tables, and code to demonstrate concepts along the way, keeping the reader engaged and on track. Ray also goes deep into some discussion of programming XML utilities with Perl. I haven't finished the book as of yet, but so far it's clearly written with working examples to illustrate the concepts under discussion.As with most O'Reilly titles, the content is high-quality and well worth the time spent reading. I do wish to note that this line, beautifully rendered on my Kindle DX, imploded the irony meter: "For reading long documents, there is no substitute for paper.Therefore, XML has had to embrace print." This text was the required reading for an intro to XML programming class that I am taking. I have had a little XML experience prior to this class, and can write HTML without a GUI. tries to be all things to all people. This book taught me a lot about XML and how it is used in the digital publishing world.XML is not limited to web sites and is a great resource for businesses institutions and other publishing needs where a common format is needed for each and every document. I recommend this book for anyone wanting to learn more about XML and how it is used. 1. YOU WILL NOT TOUCH A KEYBOARD USING THIS BOOK, IT DOESN'T NOT WALK THROUGH EXAMPLES- for those books, try "XML step by step" by Young (Microsoft), and for more advanced, "XML in Action - Web Technology" by Pardi. 2. THIS BOOK IS GREAT: because it teaches in a fundamentally different way.Most of what we see of XML is tags, attributes, the structure of the data in the elements, etc.But this book focus on the DOM.This crucial focus helps understand XML with its uses, XPointer, and transformation. 3.If you want to do a lot with XML, beyond RSS feeds, buy this book along with a walkthrough, like the books listed above. full of nonsense in whole book. For example, xml schemas chapter is from page 108 to 164 about 60 pages, but realy useful w3c xml schema only take less 8 pages, others, useless, forget them. So what is XML? It’s a markup language, used to describe the structure of data in meaningful ways. Anywhere that data is input/output, stored, or transmitted from one place to another, is a potential fit for XML’s capabilities. Perhaps the most well-known applications are web-related (especially with the latest developments in handheld web access—for which some of the technology is XML-based). However, there are many other non-web-based applications for which XML is useful—for example, as a replacement for (or to complement) traditional databases, or for the transfer of financial information between businesses. News organizations, along with individuals, have also been using XML to distribute syndicated news stories and blog entries. *	How do you use XML? *	How does it work? *	What can you use it for, anyway? 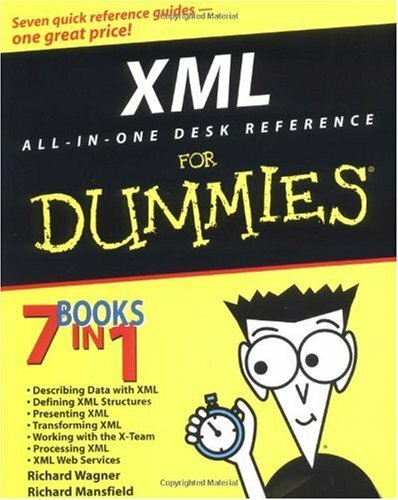 This book is for people who know that it would be a pretty good idea to learn XML but aren’t 100 percent sure why. You’ve heard the hype but haven’t seen enough substance to figure out what XML is and what it can do. You may be using development tools that try to hide the XML behind user interfaces and scripts, but you want to know what is really happening behind the scenes. You may already be somehow involved in web development and probably even know the basics of HTML, although neither of these qualifications is absolutely necessary for this book. What you don’t need is knowledge of markup languages in general. This book assumes that you’re new to the concept of markup languages, and we have structured it in a way that should make sense to the beginner and yet quickly bring you to XML expert status. *	Programmers who are already familiar with some web programming or data exchange techniques. Programmers in this category will already understand some of the concepts discussed here, but you will learn how you can incorporate XML technologies to enhance those solutions you currently develop. *	Those working in a programming environment but with no substantial knowledge or experience of web development or data exchange applications. In addition to learning how XML technologies can be applied to such applications, you will be introduced to some new concepts to help you understand how such systems work. 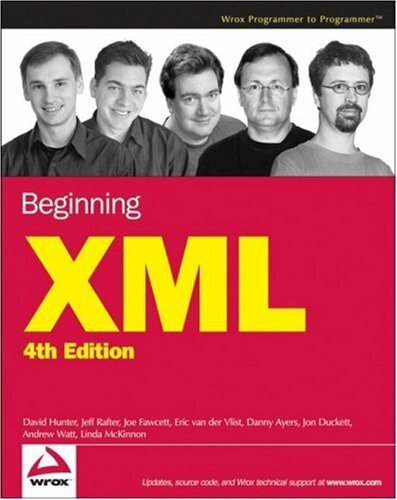 *	The book begins by explaining what exactly XML is and why the industry felt that a language like this was needed. *	After covering the why, the next logical step is the how, so it shows you how to create well-formed XML. *	After you’re comfortable with XML and have seen it in action, the book unleashes the programmer within and looks at an XML-based programming language that you can use to transform XML documents from one format to another. *	Eventually, you will need to store and retrieve XML information from databases. At this point, you will learn not only the state of the art for XML and databases, but also how to query XML information using an SQL-like syntax called XQuery. *	XML wouldn’t really be useful unless you could write programs to read the data in XML documents and create new XML documents, so we’ll get back to programming and look at a couple of ways that you can do that. *	Understanding how to program and use XML within your own business is one thing, but sending that information to a business partner or publishing it to the Internet is another. You’ll learn about technologies that use XML that enable you to send messages across the Internet, publish information, and discover services that provide information. *	Since you have all of this data in XML format, it would be great if you could easily display it to people, and it turns out you can. You’ll see an XML version of HTML called XHTML. You’ll also look at a technology you may already be using in conjunction with HTML documents called CSS. CSS enables you to add visual styles to your XML documents. In addition, you’ll learn how to design stunning graphics and make interactive forms using XML. *	Finally, the book ends with a case study, which should help to give you ideas about how XML can be used in real-life situations, and which could be used in your own applications. Chapter 1: What Is XML? : This chapter cover some basic concepts, introducing the fact that XML is a markup language (a bit like HTML) whereby you can define your own elements, tags, and attributes (known as a vocabulary). You’ll see that tags have no presentation meaning—they’re just a way to describe the structure of the data. Beginning XML provides a complete course in the Extensible Markup Language (XML) with an unusually gradual learning curve. In fact, the introduction states that the book is "for people who know that it would be a pretty good idea to learn the language, but aren't 100 percent sure why." Despite its recognition of the fuzziness of readers' understanding of the technology, the book delivers a rather comprehensive study of XML. Very little space is wasted detailing the history of XML and its relation to SGML, as is the case in many other titles. The argument for the importance of XML is made quickly, and the basics of well-formed syntax are tackled right off. One notable distinction of this book is its excellent coverage of related technologies, such as cascading style sheets (CSS) and relational databases. This book has 8 writers so I have to fit myself from one tone to another. This book is "beginning XML" so I guess it should cover all the basics using easy, clear and simple examples; however it is not. If you want to know how to do one thing, you would still be confused after read whole part about that particular topic and ended with finding out the right or understandable answer from Google. This book can only give you a list what to learn and you have to find out everything else by yourself. This is the best comprehensive introduction to XML (XML, namespaces, schemas, XSL and styles, XML in databases, XML web services, and more). I checked over 10 similar books, but this one surpass the value of any of them. But be aware that this book is an introduction (Well, maybe more than an introduction). It will be necessary other more specific material for advanced concepts (the 10% of other topics that you will need once in a lifetime). I recommend this book as a starter for XML. This book was used as the text book for a college "Introduction to XML" class I just finished.This being my first and only exposure to XML, I have to say it is horribly written.The information is incredibly disjointed and hard to follow.Yes, there are ample examples of code in the book, but not much explanation of why you have to do certain things.Some key terms were used throughout the book without ever giving a clear explanation, or any explanation at all, of what they meant.Maybe it's because there are eight authors and they didn't talk to each other when they were writing it, I don't know.I've taken three college programming classes in the recent past, up to intermediate Java programming, and have never had as much difficulty understanding a text book.I would not recommend this book to anyone, although it's admittedly the only XML book I've read, so I really don't know how it compares to others. I was required to have this 4th edition book for an XML class I'm attending.The book does cover many facets of XML which is good for someone just learning about XML but the downsides of this book make it a last choice in my opinion.The biggest problem I have with this book are the countless typos and outright errors in the text and code examples.The second biggest problem is that some of the chapters rely on a website called codeplot to complete the work but the website no longer exists - HELLO!A third big problem is that the book relies on you downloading applications that are known to cause corruption (got that straight from my instructor) in Windows - "Saxon XSLT Processor" as an example.The fourth big problem is the book is way too light on using XML with relational data bases. Finally the appendices are not complete meaning they don't show every parameter that's available when working with XML therefore you cannot rely on it as a reference.I have at least 20 Wrox books but this one is a real disappointment.I cannot recommend this book as it seems to have been thrown together without much care or concern. Most boring book I have ever read.. IT Web Major OMG DONT!! I am a 20 year IT professional and currently am back in school to modernize my skills as a It Web Development .NET student 15 credits from graduation holding a 3.97 GPA.This is the most boring book I have even opened in my life. It is absolutely impossible to read without instantly falling asleep. The examples are not for human reading, and I can barely stay awake and concentrate for more than a few minutes at a time while reading this. I am forced to read it with a straight edge so I dont lose my place and have to read each paragraph over again with little if no understanding. I am taking 5 classes every 8 weeks and read almost 5000 pages every 8 weeks - a giant textbook just like this one 5 times over. They keep coming one after the other and I have never had material for a class that I cannot learn from. A classmate called me tonight and asked if I have been able to understand a single thing in the book. He is a programmer also with a background in development holding a 3.94 GPA.He is absolutely dumbfounded that he cannot understand this. If you are not forced to try to read this book, buy anything else on the market that is available instead. I have no other recommendations since I must use this text.I am writing discussion board postings based on information that I am finding on the internet and have learned nothing from this text up to chapter 15 which ends on page 644. The authors are most likely very good progammers but they should stick with their base skill set and stay away from the word processor.They are unable, page after page, and chapter after chapter unable to relay information to at least two high energy IT professionals learning new material. I will end up with a good grade in this class, but none of the knowledge has come as a result of reading this text.It is impossible to read it and stay awake and I have never in my life had this experience - even withthe few classes that I dont enjoy - I am able to read and learn... until this text was mailed to me from my school. XML is a very dry subject and this text makes it unbearable. If you're a developer working with XML, you know there's alot to know about XML, and the XML space is evolving almostmoment by moment.But you don't need to commit every XMLsyntax, API, or XSLT transformation to memory; you only needto know where to find it. And if it's a detail that has todo with XML or its companion standards, you'll findit--clear, concise, useful, and well-organized--in theupdated third edition of XML in a Nutshell. This powerful new edition is the comprehensive XMLreference. Serious users of XML will find coverage on justabout everything they need, from fundamental syntax rules,to details of DTD and XML Schema creation, to XSLTtransformations, to APIs used for processing XML documents.XML in a Nutshell also covers XML 1.1, as well as updates toSAX2 and DOM Level 3 coverage. If you need explanation ofhow a technology works, or just need to quickly find theprecise syntax for a particular piece, XML in a Nutshellputs the information at your fingertips. I think some of the other reviews have already said it, but really, this is a great book. Not just as a quick reference, not just as a technical book, but as a book. It's well written and easy to understand once you're familiar with the vocabulary. I've enjoyed reading it. My advice to those who don't like it is to really focus on chapter 3. Book is a software technical reference. Book was delivered in a timely way, and was in excellent condition. The book is a reference for all XML standards ( XML , XPath , XSLT , XLink , XSL-FO , XML Schema , DTD , Xpointer , Xinclde , CSS ) and also covers DOM and SAX for manipulating XML , although the book covers the basics of XML in the first five chapters , the rest of the book assumes you have experience with the XML standards and need a complete reference for them , and the book do thr right job for that :) , it's the best reference available for XML . 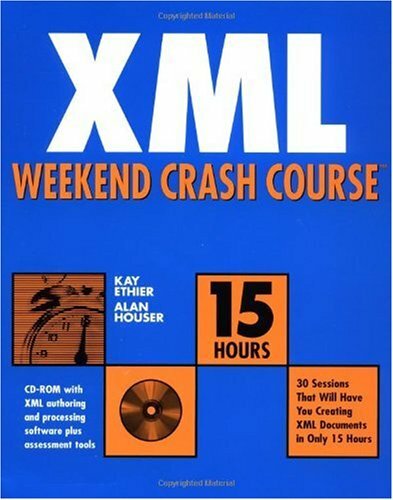 XML: the grab-bag, so-what-you-will, make-it-up-as-you-go-along, there-are-rules-strict-rules-(sort-of) technology that bends you to its will as much as you can bend it to yours.And this book is a decent round-up of the most common, widely-deployed implementations -- with enough general knowledge to help you sort through the more specific ones (or help you in creating your own). The authoritative XML Schema reference and tutorial! Leverage the full power of XML Schema! Definitive XML Schema brings together expert guidance for schema design, superior approaches to schema development, and the most systematic XML Schema reference on the market. Whether you're a developer, architect, or content specialist, it's the only XML Schema resource you need! "XML Schema is an incredibly powerful-and complex-document schema language, with such new capabilities as strong typing, modularity, inheritance, and identity constraints. This book guides you through the complexity so you can confidently use that power for your own projects." XML Schema can be really confusing but this book has made it much more clear to me.In particular, I muddled through my project never really understanding things like namespaces and elementFormDefault and weirdnesses like why complex types can have simple content, until I decided to sit down and read this book.Now I feel like I've got a handle on how these things work, plus it made me realize that XML Schema has a lot more features I didn't even know about.The chapter on extensibility was a bonus because it compared and contrasted some of these advanced features and gave me a better idea when to use them.The index is good, too - which makes it easy to use as a reference. This book was very helpful in getting me up to speed with XML Schema. It was written well and I have provided the added detail I needed to go above and beyond up at work. Priscilla's Walmsley's extensive experience is conveyed well in the book and has proven to be a great resource. I tried that and it is very hard, boring, and very unproductive. Now, try to read it with this book as a companion -- you will find yourself understanding everything on the spot. There are a lot of useful examples and explanations which are (in my opinion) missing from the standard's text. This is what makes this book so useful. Also, the organization of the book makes it very easy to locate information you need and to use it as a reference book. Trying to understand the fine details of the XML Schema standard and the capabilities of XML Schema? Trying to implement an XML parser or an XML validator? If so -- you will probably appreciate this book and will probably use it a lot! Even now, several years later, I sill find it useful and revealing. Walmsley's book is the one I go to as the reference for W3C Schema. It is clear and very accurate and reliable. I find the examples relevant and helpful. I had to chuckle at a previous review that couldn't understand why something was found in multiple places. Well perhaps it is used in several places. I would be happy that the index was thorough. Schema is a somewhat complicated language but Walmsley provides transparency and order. I recommend this book to my clients and in classes I teach on XML and Schema regulalrly. Since all other reviews are very positive, I'm here to offer a different opinion. I've had this book for over a year now, and I barely use it. Each time I attempt to find something useful in it, the information is scattered over the entire book making it extremely difficult to understand. For example, right now I'm looking up the "ref" attribute, and according to the index, it appears on 7 different locations throughout the book, each portion shorter than 1 page. Also, I have seen many tables scattered throughout with exact same information, or one or two differing field values, making it very confusing to understand which table is doing what. And at over 500 pages long, there is a large amount of filler information in this book. Is this book "definitive"? It looks like it is. Is this book usable? Absolutely not. This is one of the worst investments I've made in computer books. I needed the first five chapters to acquire the skills i needed to complement with the xslt. This book is good compared with some i have reviewed in the past 7 years. string myXMLpath = Path.Combine(Request.PhysicalApplicationPath, @"MYXMLDOC.xml"); //need System.IO namespace! Stuff like that is irritating but you can figure it out. And frankly, I prefer using a database instead of XML anyway, but that's another matter. But, the introduction of LINQ to XML has a "2nd generation" approach to XML reading, writing and manipulation in the Framework. The current volume devotes one chapter at 32 pages to the topic -- clear but relatively scant. If you think you may want to use LINQ to XML, Pro LINQ: Language Integrated Query in C# 2008 (Windows.Net) offers an extended discussion at 150 pages -- with an excellent compare and contrast with the DOM version. That provides a good analysis of the approach best for your tasks and a solid explanation of implementation. 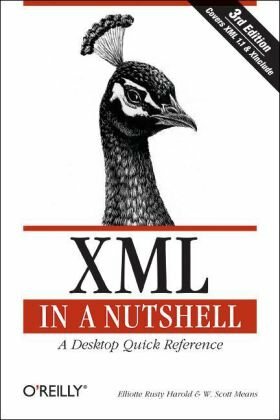 An XML book that's worth the money! The previous 5-star reviews are right, the book really showed me the quick and easy way to read and write XML files using C#, and a bonus for me was the creation of schema using different methods, where I struggled to understand with other books before. Clear explanations, but to get the most out of this book, one should be familiar with classes and objects as some examples are shown where classes are defined and created. If you're a true blue beginner to programming, you might get confused on later chapters of the book so I suggest you start with other beginner programming books first. This is a developer's guide to learning XML the shortest time possible. Keep it up Bipin! I had his Xml book for C# 2005 which was outstanding. But now with LINQ to Xml it is even better. This is THE book to get on Xml with C#. It is all you will need. XML is everywhere today. 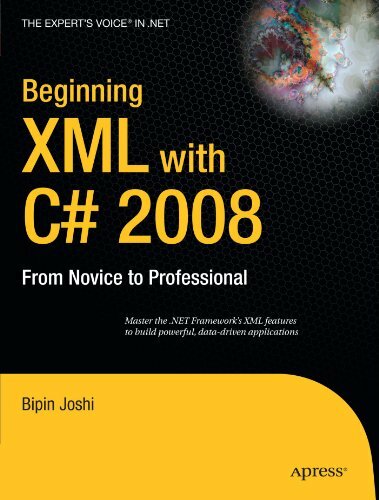 Before reading this book I had a good understanding of XML but after finishing it I can say that I have a deep understanding of the subject. The book covers XML, XSLT, XHTML, CSS, XSL-FO, different XML schemas, XSLT, XPath, XQuery in great detail using very comprehensive hand-on examples. It goes further on covering AJAX, XML and .NET, XML and JAVA. The books includes a very detailed explanation of SOAP, WSDL and Web Services. It also introduces Resource Description Framework and the Semantic Web. 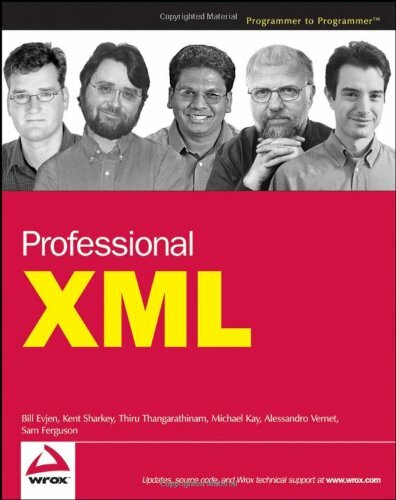 I recommend it for everyone who really wants to understand XML for professional use. When I was trying to pick a book to fill in the gaps (chasms) in my XML experience, I routed around in the amazon percentage, (what percent of people bought this book, what percent bought other books. )This one seemed to have a good go-to ratio, and on one of the other books, the review referred to this one.I bought it second hand and got an excellent price. I am pleased. It reads easily and has a useful index. more stuff including 30 pages of XML in Office Development. Is this book for programmers? Written specifically for graphic designers and production artists already comfortable working with Adobe InDesign, this book teaches you how to automate publishing without learning a lot of scary code. XML simplifies the process of moving content in and out of your layouts and can speed up any print or Web assignment. Why should I care about XML? If you’re managing data-intensive layout projects, and you want to keep that data consistent, accurate, and up-to-date, then incorporating XML can help. You can also use XML to automate processes like importing text and large numbers of graphics into a layout, or repurposing content from one application to another. Do I need additional plug-ins or special software? You need only the powerful features built into InDesign CS2, CS3 or CS4 to use this book. How will I learn XML? This guide includes nine easy-to-follow projects with downloadable support files. With these hands-on tutorials, you will learn XML in context. By the final project, XML will no longer be a mystery, but a powerful tool you can use to support your company or clients. l Business cards: Create a structured layout in InDesign and then import XML. Format text automatically and flow the text into multiple examples. l Product catalog: Learn how to import XML data into a structured layout using nested styles and cloned text. l Direct mail and variable data printing: Use XML and InDesign to create sophisticated direct mail pieces without costly plug-ins or third-party software. l Magazine and newspaper: Build and export magazine-style publications for online distribution. l Web: Transform XML into XHTML to incorporate directly into your Web pages, or use Cascading Style Sheets to instantly format your exported XML. Warning! XML Code Is Illegible! This review is not about the content of this book, because, having just received it, I haven't read it yet. From the Introduction, the content would appear to be just what I need to solve my own perplexing work problem, which is why I bought this book. Unbelievably, however, the XML code is printed in 20% or at most 30% gray, providing virtually no contrast against the white paper! I can barely read it under good lighting! Ironically, the Acknowledgments thank their editors for making their "words look so beautiful on paper." No one thought twice about this stunning design error?! I can only hope that the supplemental project files that are to be downloaded from Peachpit will help overcome this problem. Reviewer: Len Zigante, Sr. Desktop Publisher, Norco Performance Bikes. I have an interest in XML because I work in an environment that requires I regularly lay out catalogues and flyers that consist of several fairly standard formats with mostly just the text and images changing. As speed and accuracy with ever increasing volumes of data are always important issues, XML looked to me to be one possible answer as to how to address this dilemma. It does not disappoint tho there are better tools to achieve the same end in this writer's opinion if one is willing to pay dearly for them. One nice thing about XML is that it is built in, integral part of Indesign although most users are completely unaware of it's existence. It does not require the expenditure of hundreds of dollars per copy of indesign or for clients to use. Even better, XML is found in many other standard office software packages so the probability is high that data existing in one can be quickly exported to XML useable by Indesign and visa versa. The book starts off as a slow read for the first 25 pages or so due to the necessity to bring the reader up to speed with XML definitions, rules, and interfaces. It's a necessary evil as one would become quickly lost without this knowledge. However, the authors do a very good job of explaining and demonstrating things simply expecting most readers to be laymen totally unfamiliar with XML. From that point onwards the authors lead the reader through how to use Indesign's XML and tagging features (using both the Story Editor or Layout modes) with example files downloaded from the book's website. These are practical examples and what is learned here can be directly transferred to real life uses. The book starts off with simple text and image examples and progressively moves into more complex concepts such as using variable data and creating web pages utilizing HTML and CSS. Two very valuable features in this book are 1) that the authors take time to explain how to import to and export XML from several other popular software packages so the user does not have to struggle with them in order to get things working all around 2) the authors go the extra mile to demonstrate the "wrong" way to create an XML based layout that many users typically employ explaining and showing why it is "wrong" and the problems and difficulties one runs into if they choose to go that route. 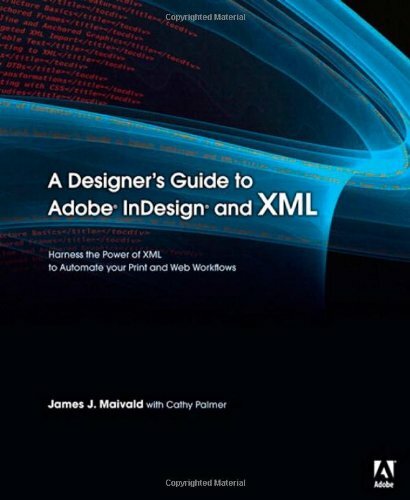 Overall this is a very good, easy-to-understand manual for anyone who wants to learn how to use XML within Indesign to speed up and improve their accuracy within workflow situations where the information presented has a structured format and is rather repetitive in nature (eg. catalogues, flyers, cookbooks, business cards, reports, etc.). If you primarily do one-off jobs where the layout and structure of the information varies regularly then this book is not for you. Simply the best to start. all is on the title. I was looking for a first, professional book about XML and Indesign. I don't have seen an other book like this yet. Really a good book, well done, filled with information to knowing and to keep with you. Tag -- XML is it! XML tags let you share your format as well as your data, and this handy guide will show you how. You'll soon be using this markup language to create everything from Web sites to business forms, discovering schemas and DOCTYPES, wandering the Xpath, teaming up XML with Office 2003, and more. I love this book. I know very little about XML, but want to learn the basics about the language. The Dummies book presents the material quite simply, which helps me understand the basics about XML. I am about a third of the way through and have already learned so much about it. I was impressed with the speed of delivery. I received the book within a few days after I ordered it. I'm in an online publishing class at a tech university with NO background in anything like this. This book saved me! It explains all so well, and allows LOTS of practice as you read. I can't understand the negative reviews. Look else where to read and learn about XML. I read this book cover to cover and was still confused after the fact. Go check out Deitel's book: "Ajax, Rich Internet Applications and Web Development for Programmers" and read chap. 12 on XML. I learned more in one chapter reading this book compared to reading the whole book of "XML for Dummies." I usually read just to get a big picture. I thought this did the job.Dummies Books are a lot more palatable than other books on topics as dry as this. the book was in o.k conditions and it took about 9 days to ve delivered at my dooor. The book binding on this book was broken.Since class started the next night, my huband taped it with packing tape.There was no packaging in the box to protect the two books in it.The box was damaged during shipping as well. 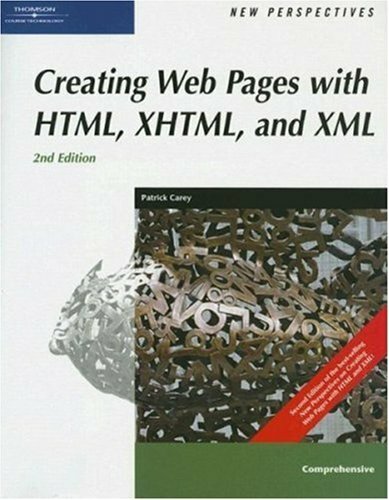 excellent books with step-by-step instructions for creating web pages.I am new to IT so am glad it's written in "regular joe" speak and not "IT speak" which is very helpful to someone like me who is making a career change. This is an over-rated and over-priced book.I am forced to use it, and find that there are better resources available in less expensive texts, and on the W3C School web site.The text is adequate, but barely so.Sell it if you have it, and avoid it if you can. I've been using XML for about six years and found this book to repeat the common already understood best practices.I was expecting this book to bring new ideas to light but instead it focused on common design practices already understood within the XML community (i.e. do I make a piece of data an element or a attribute? ).To the authors credit he does give very thorough explainations and he knows XML well. I guess more than anything this book didn't match my expectations, however it is a well written and would work for folks new to the XML community. Elliotte Rusty Harold states in the introduction of Effective XML that the book is neither an introductory book nor an XML tutorial. Rather, it is a distillation of the author's experience using and teaching XML and how to use it effectively. The book does a great job of explaining how to use XML and its related technologies. The book is divided into four major sections: Syntax, Structure, Semantics, and Implementation. Each of the fifty Items packs a lot of information into a few pages. The Items span topics such as why you should Include an XML Declaration (Item 1), Make Structure Explicit through Markup (Item 11), Program to Standard APIs (Item 31), and Write in Unicode (Item 38). Even the Introduction is valuable because it sets the definitions for XML-related terms used in the rest of the book that the author has found to be used interchangeably or inconsistently. Item 24, Choose the Right Schema Language for the Job, provides a typical example of the great information contained in Effective XML. This Item discusses the strengths and weaknesses of four schema languages: W3C XML Schema Language, DTDs, RELAX NG, and Schematron. The use of programming languages to handle situations that the schema languages can't handle is also discussed. The Item ends with a set of questions to think about when selecting the schema language to use. I found the book very readable and like that the information is presented in digestible chunks. Effective XML isn't meant to hype XML but to identify what the actual capabilities of XML and its related technologies are and how best to use them. The book does an outstanding job at this task. Full disclosure: I received a complimentary copy of the book for review. This is not a book explaining XML. This is not a book that goes into any depth on XML APIs. It is not a book explaining any one XML format like XSLT, RSS, or XSD. Instead it is a book on how to work with XML. How to design an XML application to take full advantage of the facilties of XML: schemas, processing instructions, XSL transforms, namespaces. It is all structured to slowly introduce you into the complexities, and deserves to sit up on the bookshelf with Effective C++, Java and Enterprise Java. If you already know the basics of XML, it is actually quite a good way to learn about some of the more esoteric concepts -from the pragmatic perspective. Too many XML books rant about how wonderful some feature like XML schema's extension stuff is, why XML is the most universal format ever, SOAP and WS-* the best protocol for distributed systems ever, and XQuery everything you need for an XML database. This book bursts the bubble of hype with rational analysis of what makes sense, and what doesn't. Item 28: Use only what you need, is my favourite: A review of the main XML specs and analysis of what really matters, which comes down to #35, navigate with XPath. If you are designing an XML schema/system/application, you need this book. If you have to put up with architects telling you about WS-MetadataExchange, WS-Transfer and RDF, you need a copy to roll up and hit them over the head. And, if like me, you are involved in standards bodies that produce XML related things, you need to buy a copy for all the other participants, so that what you produce will actually work. Remember that XML is a language designed for use by people and machines. The machines have the upper hand. But with this book, and some thinking, you can design XML applications that people can use. The flexibility of XML can often mean that there's a gap between using XML and using XML effectively.Elliotte Rusty Harold's book Effective XML - 50 Specific Ways to Improve Your XML (Addison Wesley) is an excellent way to move towards the latter condition. There are obviously a large number of books that will teach you the semantics of writing and using XML.But just because you can create an XML file doesn't mean that you've done it well or effectively.Harold's book provides a bridge to being able to create XML files that will be usable in nearly all situations.The book starts out in the introduction with explanations of terms that are often confused (element vs. tag, text vs. character data vs. markup, etc. 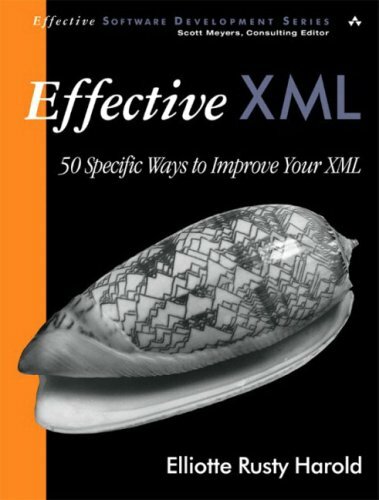 ).Then there are four parts of the book that include a total of 50 tips that will improve the quality of your XML usage.Some tips are pretty basic, like "Include an XML Declaration". Others are more complex like "Verify Documents with XML Digital Signatures".But every one is practical and useful for making sure that your XML is widely useable by all potential applications. The Product arrived as it was descriped.Great transaction.Will do business again! The book was in better condition than described. I needed the book fast and specified expedited delivery. Order was placed on a Friday, delivery was on Monday. Seller will even buy back the textbook after semester. I will definitely keep them in mind for a future purchase. The book was new as described and I received it very quickly. I would suggest using a carboard box or wrapping instead of the flat rate evelopes as USPS kind of mistreated it. The mail man tried rolling the book and tried fitting it into my tiny apartment mailbox. This books is great for anyone trying to learn XML. I am currently in a class that is web only. So with no in class instructions the book is even more key. This book is written step by step explaining why you are doing what they are instructing. A varitable cookbook for XML. As opposed to the Java class I took over the summer. The instructor could not have picked a more poorly written book. Some people know there stuff and others can actually put it into words that the novice can understand and relate. This is the sign of a true teacher. Carey is able to do this. I have had other classes with his books and they have great as well. The other benefit is that this books was much cheaper through Amazon than the bookstore. I would highly recommend this book. A perennial bestseller, the handy XML Pocket Reference from O'Reilly has been revised once again to give you quick access to the latest goods.In addition to its comprehensive look at XML, this third edition has been updated with new material on Namespaces and XML Schema--considered among the most important elements in current XML use--along with RELAX NG and Schematron, additional powerful tools for describing XML document structures. Like other titles in O'Reilly's Pocket Reference series, the XML Pocket Reference, 3rd Edition features a well-organized format that gets right to the point.As a result, it's already won over the allegiance of developers everywhere.If you need XML answers quick and on the fly, this compact book is most definitely the book for you. The book was in A+ condition, but the shipping was slow, no wonder though, since it was sendt to Norway from New Zealand. The book was thoroughly packed. The seller is highly recommended. I bought this guide because I needed a quick lookup for XML schema elements (something you'd think would be readily available online, but isn't - at least not in a usable form).The bulk of the book (70 of its 162 pages - about half) is dedicated to XSD, so I was very happy with what I got.The first 30 pages cover XML itself (all the nitpicking details like predefined entities, what characters are allowed in attribute names, etc).The next 17 pages cover DTD (which you may occasionally still need to know, even these days).The next 70 cover XML Schema, and the book finishes up with an additional 43 pages on Relax-NG and Schematron (two competing, and not very common, schema definition formats). I agree with other reviewers that the book would have been complete without the Relax-NG and Schematron coverage, but it would have just been 43 pages shorter if that was the case - there's really not much else they could have said about XML, DTD and XSD and still have been a concise "pocket reference".This book is actually pretty thick for an O'Reilly pocket reference - I have four other pocket guides on my bookshelf right now, and the other three have 120, 124 and 66 pages each.By that standard, I figure the coverage of Relax-NG and Schematron were just a "buy one get one free" type of add-on, especially since this book costs the same as all the other pocket reference books. This book is a perfect reference for somebody who needs a quick, handy reference to XML schema and the occasional XML rule. I am one of the coauthors of this book. I feel compelled to write a review in support of my friend and coauthor, Simon St. Laurent, who wrote the section on XML Schema. Of the 160 pages of text in XML Pocket Reference, Third Edition, 71 pages are dedicated to XML Schema. That's 44 percent of the book. Of the 71 pages, 16 pages cover examples of XML Schema. DTDs are covered in 15 pages, RELAX NG in 32, and Schematron in 10 (57 pages total). 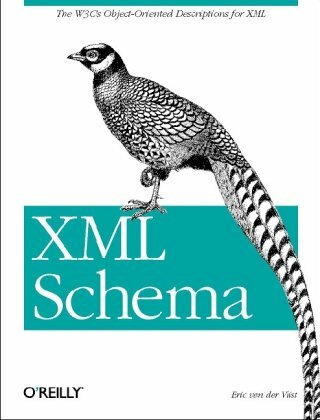 XML Schema receives the most extensive treatment of any of the topics covered, and within the limitations of the size of the book, Simon did an excellent job. XSLT and XPath were not included in this book because a new, separate volume has been dedicated to those topics-XSLT 1.0 Pocket Reference, by Evan Lenz, which also appeared in August 2005. As for the production rules, they were included for programmers and others who need grammars. The productions, which come from the XML spec, are a means for understanding XML syntax precisely, and it would have been unwise, in my view, to omit them. In addition, I feel the regular-expression-like inclusions should have been omitted. These include something referred to as Productions in one part of the book and Contents in another. Maybe good for hard-core CS people, but pretty much useless for those of us who just want to work with XML Schema. An ideal replacement would have been some examples illustrating sample usage of various elements and attributes. All in all, the descriptions accompanying the elements and attributes are pretty good. Unfortunately, that accounts for only about one-third of the book. But it only costs $10 and it is small, so maybe it's worth it. 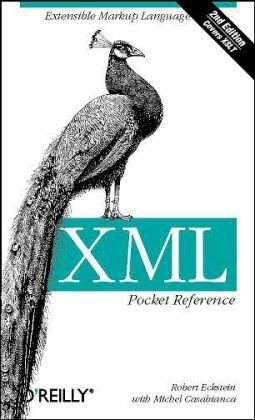 Admittedly, trying to cover "XML" in a single book is a daunting task.XML is made up of so many standards and technologies (XPath, XForms, XML Schema, etc.) that you either have to specialize your coverage area or be ready to publish a *really* heavy book.To their credit, the authors stripped out XSLT into it's own pocket guide.That act keeps this particular book small enough to fit in your pocket and that's good.But if you're wanting information on XSLT and think this might be your book, forget it. Next, the XML Structures and Document Type Definition chapters seemed to be a little confusing.There was something introduced that I had never heard of before...something called "Productions" followed by syntax that looked like regular expression language.Never having seen that term before in my XML reading, I went back to the introduction to see what the authors wanted to convey there.The only explanation was "As each structure is discussed, applicable productions from the XML 1.0 and 1.1 specs will be listed in the order in which they appear in the specs. "So, I still really don't know what productions are, and I probably have to go to the specs to find that out.The description of each section in an XML document, like CDATA or declarations, was nice though. The book starts to become really useful when you get into the XML Schema section.There they go into each of the elements along with each attribute that can be used with the element.This is the type of reference information I'd expect to see in a pocket guide.Something I can turn to quickly as a refresher for what parameters or attributes I can use with an element, or to gain a quick understanding of an element I haven't seen before.This same structure is followed for the RELAX NG and Schematron schema languages, so the book will be helpful if you live in those worlds also. I have bought a lot of Programming Books, at least one other of this "Brand" and have NEVER before written a negative review. I am so disgusted with this book that I decided to at least get the word out. Realizing this book was published in 2001, I know they could not foresee everything about this programming language, but you do not set up more than half your book based on one piece of software. Of course there are other ways to go further with XML without the Instant Saxon software they tout and insist you must use. It is included on the disk, but doesn't work and is not supported(the web site they send you to is vague and the downloads you may use there are confusing and not helpful). Now I will be looking elsewhere for that information when I bought this book for that reason, and all of the fragments of code they have had me updating, waste. The SUPPORT Web Site is non-existent, and the disk harder to access than a 1999 magazine demo disk. It starts out pretty good, but then they begin doing more complicated code that apparently needs to use Instant Saxon, for reasons which I now do not know. Of course, I might have known if only they had stayed with the 'program'. . If this book were really about XML, none of these things would be so tackily and weakly done. Good book for someone new to html, xslt, xml and the like. You get a good background of the evolution of the webspace languages as you are learning, and lots of little self-tests and pretty good examples. I had trouble with the CD-Rom, the Turbo XML included either no longer supported the beta copy or I missed something in the installation, in any case I never bothered with it any more. 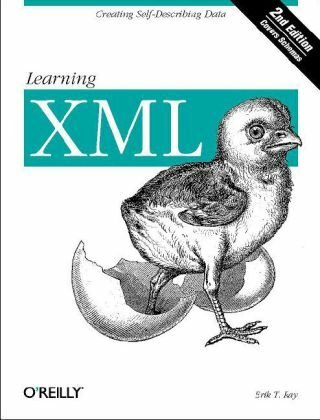 I was mostly just using it to gain an overall understanding of XML before I started studying XSLT. For that it was sufficient. I didn't really do many of the examples, but they seemed well developed and had a logical flow. The part I had a little problem with, but only a little, was when it came to writing code that would access outside data, especially tables and databases, and a bit with how the sorting worked. Probably had I done some hands on work it would've clarified it, but I was a bit lazy for that. In any case, overall it takes a simple language and doesn't make it needlessly complicated, and the style is light and breezy without being flippant. You probably could knock it out in a weekend. A great introduction to XML. The example programs and tutorials cover a breadth of topics.The sections are related and continue to build on useful tools and suggested practices. I would recommend the book to anyone new to XML that wants to rip through some examples and would like to know about dtd and xlst. I knew nothing about XML and needed to come up to speed quickly.This book served that purpose well.It starts with basic theoretical explanations and goes into some technical detail.It did not teach me "everything" I needed to know, but it did a good job of getting me started.I would recommend it for a novice with little to advanced technical background who needs to learn XML. * The complete solution! This revolution in product design incorporates 6 books in 1 straightforward desk reference. Provides in depth coverage of the many features and specifications of XML, the data interchange standard of choice. * XML All in One For Dummies is a true desk reference designed to guide readers through the features and specifications of the leading edge XML dialects and help them develop their own custom Web applications all under one cover. * Covers XML basics, using DTD's with XML, XML namespaces, XML schemas, styling XML documents, XML's linking languages, XML tools, using XML in the real world, and more. 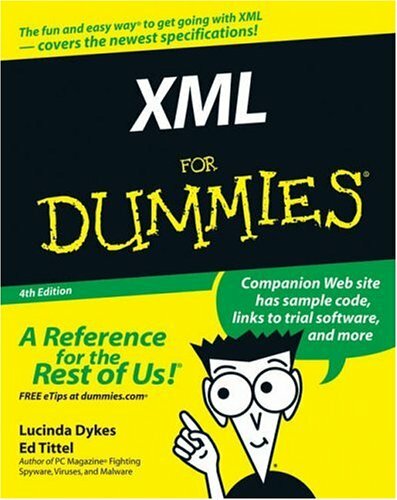 * The first two editions of XML For Dummies have sold more than 85,000 units. * According to Microsoft's CEO Steve Ballmer "XML will become the universal medium by which Web sites and users of Web sites communicate." * Written by NIIT a global training, IT consulting and software development organization. NIIT trains over 150,000 individuals each year in Information Technology areas. I found this book to be an excellent introduction to XML and the XTeam, as the book calls it, but in reading it I realized that the book is only just an introduction to a much broader world.I think that it is perfect for beginners, and does a good job of steering you in all the directions you can go with future studies. Some things to consider...although the author does not assume you have any previous knowledge in Web development, I don't think it would be possible to comfortably pick up on XML without knowing HTML and XHTML and the CSS knowledge that you should have when learning XSLT.As far as covering XSLT, you should definitely buy another book for that because XSLT mastery is beyond the scope of the book. It is well-written and flows good.The way the book is written is so that you don't have to flip when using it as a reference.So, if you read it cover-to-cover, information repeats itself.If you do have experience with Web languages you might feel like you are getting too much information, but it is worth reading through to find those lesser known bits and pieces of info.The author is thorough with the material he decides to cover, enough so that you can intuitively plan your own code rather than simply emulate examples.Overall, I would say the book has definitely given me a great appreciation for XML, and I want to take it to new levels. Though the book covers material quickly and lucidly, the editing is very sloppy and key details are omitted. For example, in discussing using the ID datatype for attributes in DTDs, it omits a key detail: a number isn't an XML name, and to get around this, prepend an _. The example given even shows a useage that won't work! The O'Reilly book of a classmate included this. Elsewhere the text discusses examples that aren't in the book and seem left over from a previous edition, and reading the text is distracting for the grammatical errors. In general it appears that the book was thrown together in a big hurry, which is a shame, as it's a very likeable book and would be great if the information was correct. The author's have done an outstanding job in writing the book.I found that even the mundane details were covered in the right place and with a little humor.The coverage starts out very simple, so many people won't use the beginning chapters extensively.However, as the book progresses, the coverage becomes more technical and I think that most people will find the authors have covered most of the XML details that any developer will need.The authors also discuss some of the details that other books leave out, such as the default namespaces.Little bits of information like this make the difference between a book that merely teaches and one that really helps.This book has something for everyone.Novices will get the most out of the book, but even advanced readers will receive some benefit.The thing I like the best is that the book is arranged as a quick reference--something that makes it especially useful when you're trying to complete a project and need to know some detail you've forgotten. Before reading the book, I was knowing nothing about XML, but after reading a few chapters, I got familiar with the technology. Good book but beware of "Volume1" and "Volume2"
While the contents of the book, as well as how it's been written are well worth the money, I wanted to enter this review to warn others that there are different volumes. I bought this guide book online expecting to receive the entire 1100+ pages.When I received the book, I saw "Volume 2" on it's cover.I opened it up to see that the very first page was "Part III".No table of contents, no typical Preface, etc. I sent the book back via Amazon's return policy, with no problems, and received the replacement very quickly.However, I now have "Volume 1".Parts I and II. Yeah.The description above makes no reference to a Volume 1 or Volume 2. (If it does now, then good.Amazon has updated it's text.I wish they had done so earlier).So I still have 1/2 of a book. great book on xml, specially on different kind of parsers, their purpose, advantages and weakness. If only every technical book was written this well!Anyone who is working with Java and XML should have a copy of this book.Highly example driven with clear explanations, the author makes using XML in your Java programs a breeze.Even better, the author has a style that makes the book fun to read as you feel like you are learning all sorts of secrets from an XML insider. The book starts with a quick introduction to XML and then gets into how to create XML documents in your programs.The first four chapters cover everything you need to know about creating XML whether it is for XML-RPC, SOAP, or simply to store in a file.The next section covers parsing XML documents.SAX and DOM are compared and then the next eight chapters discuss these two methods of parsing documents, explaining how to use them, comparing them, and helping you determine how to decide which technique to use for which situation.The section on DOM explains not just how to parse documents using DOM but also how to create new documents.The final chapters of the book cover JDOM, XPATH, and XSLT. Did I mention that this book is full of examples?The author doesn't rely on simply explaining how something works or how to use a technology (even though his explanations are excellent), he has examples to demonstrate everything he discusses.Each example builds upon the previous example andmakes learning the techniques easy and enjoyable. I really like reading this book.It is easy to read and understand.The author does a good job of describing the XML technologies related to JAVA.This book has a lot of code to analyze.This book is a must have for the experienced developer who wants to do JAVA with XML.I have a message for the experienced developer: THE CODE WILL CHALLENGE YOU; IT CHALLENGED ME!!! This is definitely a valuable resource for anybody dealing with XML and Java, written by one of the best tech writers in town. The author covers in details a huge amount of topics and API, so many that you couldn't ask for more. A real need for further editions on this book. As others have commented, it's very poorly constructed, poorly indexed and you'll be hard-pressed to quickly find accurate definitions. As other posters have suggested, O'Reilly should be worried that this one got published in this state. This book tells you what you need to know.However, it is a bit of a hard slog because it doesn't tell you why you need to know it.It also throws in obscure acronyms and not only expects you to know what they stand for, but what those protocols/standards/programs imply.Yes, you can learn all you need to know about SQL schema, (and more than you need to know - without telling you why you need to know it, you don't know what to skip), but it is a little more painful than it has to be. XML Schema is used almost everywhere (in connection with XML documents, Web Services, SOAP etc.). So I as other people needed to master XML Schema. There is not a great choice of XML Schema books. Specification is already quite getting old. The book is not easy to read. I read it sequentially chapter after chapter and I mastered a lot of basic rules. The main problem now I see is, XML Schema itself does not give you too much of design freedom. Sometimes you need to define a structure (data type) according value of other elements. So now I know mainly what is not possible to do in XML Schema. After all I have to recommend the book. You have to read it twice. 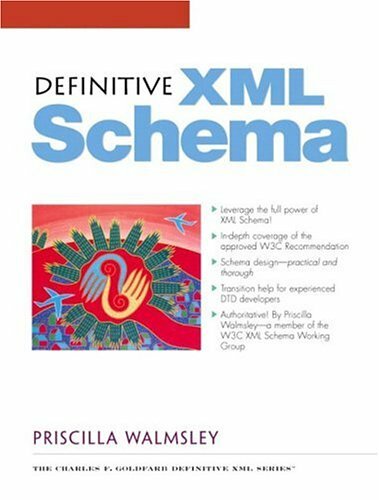 So I have just bought another XML Schema book from Priscilla and I hope I will get to know XML Schema from other point of view. This book is very dry and terse. It has all of the required content but it doesn't provide much perspective of how it should be used. You could use it as a reference, but I recommend the XML Schema Companion before this one. This book had potential to be a definitive guide to XML schema.This is not the kind of book you can pick up and read cover to cover (unless insomnia is a real condition for you, in which case this book may help).It is, by no means, a tutorial of XML schema - or even a reference.It's more of an exploratory academic walk of the W3C recommendation and all of its foibles and nuances.There is wealth of information in this book, if you can glean it out from inbetween the droning prose and historical diatribe. This is the sort of book that put O'Reilly on the map. Concise, practical, step-by-step, the kind of book that allows you to get significant amounts of actual work done by the time you finish the third chapter or so. The introduction to XML in chapter two is one of the best I've ever seen, and I've often recommended it for people as an XML Executive Summary, even those who will never write a line of Perl. Like that late 2006 early 2007 meme says: "It does just what it says on the tin." XML has begun to appear everywhere. XML has long served in hidden roles on servers and in configuration files. Microsoft Word 2003 for Windows now supports reading and writing XML to in it's wordprocessingML format. Unlike MS Word's horrible "Save As Web Page" feature, wordprocessingML, or wordML for short, is a clean usable format. The adoption of XML in a user space as common as MS Word in an accessible format means that developers have a rich opportunity in XML. 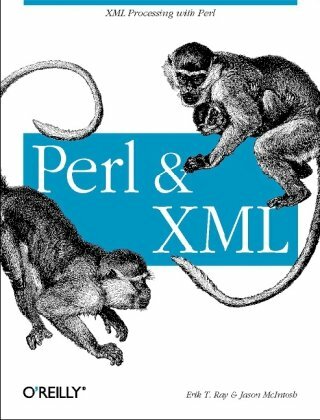 The book Perl and XML focuses on the where Perl and XML meet. In asking the questions "Why Perl? ", the authors Erik Ray and Jason McIntosh point to Perl's ability to handle text, strings, and regular expressions. The authors also point out in a clear and concise manner the strengths of XML as a means for structuring data. The book focuses on working with XML using Perl. Tutorials of the basics of either language are best found in another book. The author of the book recommends Learning Perl for those people starting out in Perl. The book does not assume much knowledge of XML, so it's really an XML book for Perl programmers. If you'd like a more in depth discussion of XML, you might check out Erik Ray's Learning XML. Surveying many conventional XML tools and applications, the book addresses big picture items such as tree processing and streams as well as specific items such as RSS and SOAP. Approaching XML from both a practical point of view and strategic point of view, the author provides detailed examples and observes which strategies work well for handling XML in Perl. Originally, I picked up Perl and XML to address a couple of small projects where I had to deal with XML. The examples in Perl and XML were well written and provided the information I needed to try out common Perl tools for handling XML. Unfortunately, I found that XML processing in Perl was unacceptably slow for the two projects I had at hand. In a short amount of time, I hacked together a faster solution without relying on an XML parser. That said, I gleaned a great deal from Perl and XML which I imagine I will be putting to use soon. If you're not currently working with XML, you may find yourself working sooner than you think. I couldn't more highly recommend Perl and XML for thorough treatment of the subject even if you end up hacking your own solution. I liked the way this book was structured - it was a quick read over a thanksgiving family visit, and it gave a good overview of what XML is and what XML isn't, and what tools are available already in Perl to use it. I particularly liked the middle of the book, and how it dealt with trees and event streams. First there was in short intro chapter on why you'd want to parse XML as an event stream, and some simple modules that give back event streams. Then the next chapter would be a longer one on SAX - the definitive way to do event streams. Same thing with trees and DOM. It ends with some examples of real-life XML processing, such as consuming and producing RSS feeds. The book also has the best description of Unicode I've ever read, and did it with just a few pages. What ticked me off about this book were the egregious errors in the sampe code. The very first piece of code they show in chapter 3 is a 100-line XML parser that doesn't need any support modules. The problem is that it doesn't recognize any XML because the regular expressions are wrong, which was pretty confusing for me (I'm relatively new to Perl, so I figured they were just "another way of doing it" that I didn't understand). I downloaded the examples frm the O'Reily website, and they're wrong there too - so it's not just a printing error. Worse, the example XML file I tried to test the parser on was also from the tarfile I downloaded - but it was invalid XML! (example 3.4). So I was trying to learn XML with a sample parser that didn't work, on invalid XML! This is not the quality I am expecting from O'Reilly! There are other errors in the code too - so be sure and check back with the errata page if you're going to seriously use the code. If they'd run their sample code beforeprinting, I'd probably give this book a better rating. I have wanted to learn about XML, but I found the pure XML books dry and too theoretical.However, putting XML in the context of something familiar, i.e. Perl, made it much more accessible.This book gives a nice overview of XML parsing using event based and tree based parsers that are available as Perl modules.The book presents SAX and DOM standards compliant modules as well as modules with more Perlish interfaces, e.g. XML::Grove and XML::Twig.It discusses the pros and cons of event vs. tree parsing of XML as well as a few advanced technologies such as database integration and SOAP.The only knock I have on the book is that the examples are a bit contrived and do not show how to solve meaningful problems. A book published in 2007 uses as markup plain old HTML, uses IE6 as XSLT processor... the worst book ever published about XML technologies. 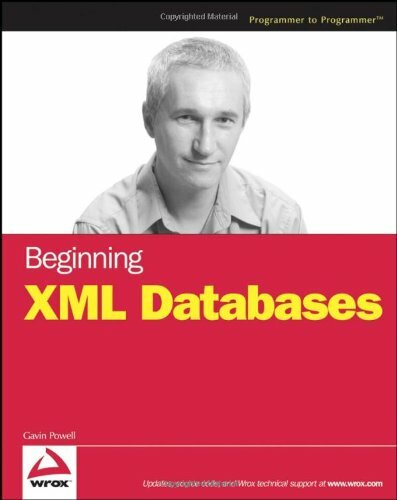 In the very beginning of the introduction, Gavin states "This book is for beginners", and then "the target audience is anyone wishing to know brief details of XML and database technology" and then "Anyone involved with either XML or database technology, from the novice all the way through to the expert, would benefit from reading this book. "I decided to ignore what to me seemed apparent inconsistency and went on. In the first chapter I learn "XML can, in some respects, be considered an extensible form of HTML. "I wonder if the author has ever heard of SGML or profiles.Under XML syntax I find "the optional second line contains a stylesheet reference, if a style sheet is in use. "I put aside my immediate question pertaining to the validity of one-line XML documents and just wonder if the author knows that there are other means to associate style sheets with XML documents. "Exceptions to this rule is the XML definitional element at the beginning of the document, declaring the version of XML in exceptions, and an optional style sheet:""
At this point I put the book on the shelf to gather dust.The combination of the incorrect verb, the mislabeling of a processing statement as an element, and the basic logic conflict between the two adjacent sentences, was just more than I wanted to tolerate. There may be some good information deeper in the book, but if the author and his proofreaders are not more careful than this, I don't have the time to risk looking for it. Very relevant combination in IT today.. 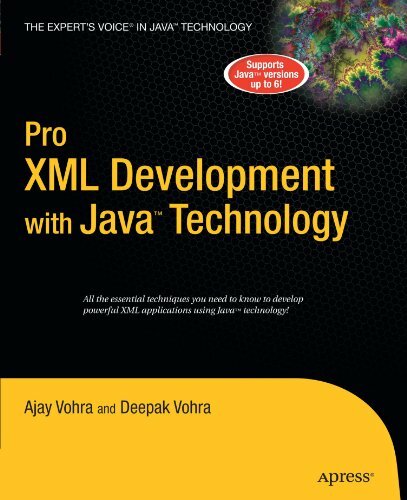 Pro XML Development with Java Technology has been written to help you, the professional Java developer who needs a practical hands-on guide to marrying these technologies together effectively. There are a lot of books out there, but none really explore the combination deeply, and they are largely theoretical. The main objective here was to consolidate the theory and practice of XML and Java technologies in a single, up-to-date source, that is firmly grounded in underlying XML concepts, and can be consulted time and again to rapidly speed up enterprise application development! The title is misleading. It is not yet another book on Java and XML. While some of the topics have been covered elsewhere this book deals with JAXB 2.0, DOM 3, XPath in Java SE 5. Also the authors provide the source as Eclipse projects. A very useful and concise book. It's a decent book for people that want to get a quick summary of the different technologies that exist to combine Java with XML. But it mostly fails as both a learning book and a reference: it simply doesn't explain things in enough detail for people to really learn the ins and outs of a technology. That being said, the basis is solid and the book does contain useful informations. The early chapters are informative and fairly elaborate, and the chapter on web services gives a very good and useful overview. Unfortunately, the book is brought down by chapters that are very lacking in detail (JAXB, XSL:FO) and/or don't add anything. The chapter on translating XML to XLS is a low; It's basically a very long and very trivial Apache POI tutorial that has next to nothing to do with XML. Also, many pages are wasted on examples that explain how to set up Eclipse to run certain example projects. These examples go on forever, are mostly trivial, are unlikely to of much use(since they are not base on Maven) and most importantly, have nothing to do with XML. author's sarcastic language mocks "idiot-reader"
Information in the book is great. 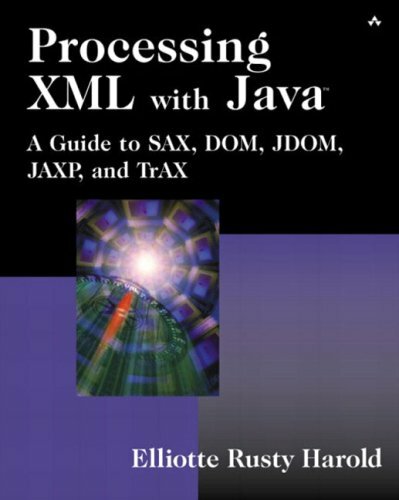 This is a very decent book on XML with Java. Lots of examples and it is pretty well organized. Good coverage of SAX, StAX and JAXB. Be aware that if you are looking for in depth coverage of XSLT or XPATH this is not the book ( and doesn't purport to be). Although examples are for Eclipse IDE I was not fazed by this at all and readily translated them to my IDE.